* In 2001, there were only 4 million cellphone subscribers; whereas by 2007-2008, the number of cellphone subscribers was around 350 million. Thus by fixing license fees at 2001 prices, the Telecom Ministry enabled companies that were allotted licenses to command huge premia. * Swan sold 45 percent of its shares to Etisalat (a United Arab Emirates company) for $900 million (in 2008 around Rs 4,200 crores). The company had obtained its license for Rs 1537 crores. * Unitech Wireless sold 60 percent of its shares to Telenor (a Norwegian company) for Rs 6,200 crores. Unitech had bought its only asset, the spectrum license, from DoT for Rs 1,661 crores. * Tata Teleservices sold 26 percent of its shares to DoCoMo (a Japanese company) for Rs 13,230 crores. * Based on the aforesaid sale of shares by Unitech and Swan, the market value of these 9 new 2G licenses amount to a total of Rs 70,022.42 crores, for which these 9 companies/conglomerates had paid DoT a total of Rs 10,772.68 crores. * Thus DoT lost the difference, amounting to Rs 59,249.74 crores. Thus, by selling these 9 licenses at the lower price Raja caused a loss in the range of Rs 60,000 crores to the Indian exchequer. 2G സ്പെക്ട്ര് ത്തെക്കുറിച്ച് വിശദമായ ലേഖനത്തിന് നന്ദി. സുബ്രഹ്മണ്യസ്വാമിയുടെ പരാതിക്കു മുമ്പ് തന്നെ ഇടതു കക്ഷികള്‍ ഈ വിഷയം ചൂണ്ടിക്കാട്ടിയിരുന്നു. അന്ന് അത് ആരും പരിഗണനക്കെടുത്തില്ല. ആദ്യം വരുന്നവന്‍ ആദ്യം കൊടുക്കുക എന്നത് എന്റെ വീട്ടില്‍ നടപ്പാക്കുന്ന ഒന്നായി എടുക്കാം, സര്‍ക്കാര്‍ സംവിധാനം കുടുംബ സ്വത്ത് പോലെ കൈകാര്യം ചെയ്യുന്നവര്‍ക്കും അങ്ങിനെ ചെയ്യാം . The CBI on Wednesday carried out searches at the residences of former Telecom Minister A Raja in Delhi, Chennai and his village Velur besides conducting raids at the premises of a possible business associate and four other Telecom officials, including his personal secretary R K Chandolia, in connection with the Rs 22,000 crore 2G spectrum scam. The CBI sleuths began searching Raja's homes from early morning Wednesday, nearly a month after he was forced to resign as minister on November 14 in the wake of the CAG's report that the rates at which 2G spectrum was allotted resulted in a possible loss to the exchequer of Rs 1.76 lakh crore. An eight-member team conducted searches at Raja's house in his native village Velur in Perambalur district from the morning, while other teams were searching the homes of his brother and sister in Srirangam and Tiruvanaikaval in Tiruchirapalli district. Former Telecom Secretary Siddharth Behura on Tuesday appeared before the Public Accounts Committee (PAC) and is understood to have told it that all decisions related to 2G Spectrum allocation had been taken by the then minister A. Raja and he only carried out the orders. Mr. Behura reportedly told the Committee headed by BJP leader Murli Manohar Joshi that most of the decisions on 2G allocation had already been taken before he joined as the Secretary in the Department of Telecom, sources said. He is understood to have claimed that the communication between the PMO and Mr. Raja was enough to indicate that the decision-making powers were confined only to the minister, they said. Mr. Behura said the only decision he took was about the issuance of a press note, which is now part of the CAG report. He said he had added a paragraph in the press note to which Mr. Raja had objected. The controversial press note issued on January 10 gave prospective applicants only 45 minutes for submitting their applications with the ministry. The former secretary said he only carried out the decisions which the minister had taken. During a brief interaction with Mr. Behura, some members reportedly wondered how he was not aware of the things going on in the ministry though he was the secretary for 21 months. To this, he is believed to have contended that decisions were taken elsewhere. Former TRAI chairman Pradeep Baijal also appeared before the Parliamentary Committee and made a power point presentation informing it about the developments during his tenure as the chairman of TRAI. He also mentioned about the migration package and supported the government’s decision to provide cheap telephone services to the common man. Mr. Baijal, who also was earlier Telecom Secretary, reportedly claimed that the Rs 50,000 crore loss due to migration package was settled by different parties out of court. The two would be called again before the Committee in the coming days. NEW DELHI: Faced with the combined onslaught from the entire Opposition, including his own party, the BJP, Murli Manohar Joshi was on Tuesday forced to curb the activism displayed in convening meetings of the PAC to discuss the CAG report on 2G spectrum allocation scam. The move to fast-track the PAC probe into a corruption issue that has brought the ruling UPA and the Opposition face-to-face in Parliament, paralysing proceedings of both the Houses in the winter session so far, had threatened to dilute the Opposition’s campaign for setting up a JPC to unravel the scam. Joshi’s unilateralism came as a big embarrassment to the BJP, which has taken the lead in stalling proceedings in the two Houses of Parliament in support of its demand. Wary of the Opposition campaign getting derailed, NDA convenor Sharad Yadav got the BJP leadership to summon the former HRD minister, who heads the PAC now. At the meeting of the BJP and its alliance partners held on Tuesday morning, Yadav minced no words in holding Joshi responsible for weakening their efforts to pin the government down on the issue of corruption. “Even the other Opposition parties have been taken aback by Joshi’s decision to convene the meetings of the PAC on a day-to-day basis, deflating our entire endeavour to corner the Congress,” Yadav said in the NDA meeting held to finalise their strategy for the day. The JD(U) leader’s contention was backed almost all the BJP leaders present at the meeting, including Gopinath Munde and S S Ahluwalia, besides Yashwant Sinha. Joshi, in his defence, sought to give a laboured explanation, arguing that he had no intention of undermining the “form-JPC” campaign, and that he was fully behind it. He assured the gathering that the PAC would adopt a “go-slow” stance. The upshot of all this was that the next date for the PAC meeting on the 2G spectrum scam has not been finalised, even though it was decided that CAG Vinod Kumar Rai would be asked to offer his version of the scam at the next round. Since former Trai Chairman Pradip Baijal and former Telecom Secretary Siddharth Behura had already been asked to appear before the PAC on Tuesday, they deposed before the parliamentary panel. Baijal, in his deposition, sought to justify the decisions taken by him in his capacity, first, as the telecom secretary and, later, as the Trai chairman. He gave a power-point presentation of the measures taken during his two stints. “It was because of the steps that we took that teledensity could increase, so much so that we can now compare ourselves in this respect with China. Infact, the increase in telephone connections has been higher than China ,’’ he argued. Behura, in his testimony, said that he took over as the telecom secretary on January 1, 2008 and handed over the reins of the department to his successor on September 30, 2009. “All the major decisions were taken before I took charge. They were taken at the level of the minister,’’ he said, seeking to disentangle himself from the decision-making process. His only contribution, Behura maintained, was to take out a press note in January, 2009. കുംഭകോണം - അന്വേഷണവും നഷ്ടവും പുതിയ മാനങ്ങളിലേക്ക്. 2001 ല് ലേലം വിളിച്ച് ഉറപ്പിച്ച തുകക്ക് തന്നെയാണു 2008 ലും സ്പെക്ട്രം ലൈസൻസ് വിതരണം നടന്നത്. അപേക്ഷ കിട്ടുന്ന മുറക്ക് നടപടികളെടുക്കണം (First Come First Served) എന്ന തത്വത്തിൽ അധിഷ്ടിതമായാണ് 2001 ലെ ലൈസൻസ് വിതരണം നടന്നിരുന്നത്. എന്നാൽ ആ തത്വത്തിൽ നിന്നും 2001 ലെ വിതരണത്തിലും വ്യതിചലിച്ചിട്ടുണ്ടെന്നു സി.ഏ.ജി യുടെ രിപ്പോർട്ടിൽ കാണുന്നു. എന്നാൽ സി.ഏ.ജി അക്കാര്യം കൂടുതൽ വിശദമായി അന്വേഷിച്ചിട്ടില്ല. അതു കൊണ്ട് 2001 ലെ സ്പേക്ട്രം വിതരണം കൂടി അന്വേഷണ വിധേയമാക്കണമെന്നു സുപ്രീം കോടതി ഇന്നലെ (8-12-2010) സി.ബി.ഐ യോട് ആവശ്യപ്പെടുകയുണ്ടായി. അതു നടക്കുകയാണെങ്കിൽ രാജ്യത്തിനുണ്ടായ നഷ്ടം ഇനിയും കൂടാനാണു സാധ്യത. 2001 കാലഘട്ടത്തിൽ ബി.ജെ.പി ആയിരുന്നു ഭരിച്ചിരുന്നത്. ബി.ജെ.പി യിലെ അരുൺ ഷൂരി ആയിരുന്നു ടെലികോം മന്ത്രി. സുപ്രീം കോടതിയോടൊപ്പം, രത്തന്‍ റ്റാറ്റയും ഈ കുംഭകോണം 2001 മുതല്‍ അന്വേഷണം ആവശ്യപ്പെട്ട് കത്തെഴുതിയിരിക്കുന്നു. കൂടാതെ പല ആരോപണങ്ങളും. ഒരു കോര്‍പ്പറേറ്റ് യുദ്ധത്തിനു തുടക്കമാണെന്നു തോന്നുന്നുണ്ട്. Tata Group supremo Rata Tata today strongly came out in support of the government's 2G spectrum allocation policy saying it broke the powerful cartel, and backed the probe covering the period since 2001 when BJP-led NDA was in power. He also hit out at BJP saying "many of the flip-flops in the telecom policy occurred during the BJP regime". Tata's suggestion for extending the period of probe came within a day of the Supreme Court seeking to widen the ambit of CBI probe into the 2G spectrum scam to cover the policies introduced in 2001 by the NDA regime. On the allegation that group company Tata Teleservices (TTSL) was a beneficiary of out-of-turn allocation of spectrum, Tata said that the true position is that TTSL has not, "I repeat not" been advantaged in any way by Raja or any earlier minister. Taking a strong exception to an open letter written to him by former telecom entrepreneur Chandrasekhar, an independent MP elected with BJP-JD(S) support four years ago, Tata said this was politically motivated and was aimed at embarrassing Prime Minister Manmohan (rpt) Manmohan Singh and the ruling party. Chandrasekhar was the past president of Cellular Operators Association of India (COAI), the lobby GSM operators. GSM one of the two technology platforms, the other being CDMA on which TTSL was offering services prior to the use of dual technology came in 2008. "Your affiliation to a particular political party is well-known and it appears that political aspirations and their endeavour to embarrass the Prime Minister and the ruling party may well have been the motivation behind your letter," Tata told Chandrasekhar. Alleging that some media houses were also partial in the coverage of the entire issue in deference to the owners who were the real gainers in the telecom sector, Tata said Chandrasekhar had kept the current trend of "attempted character assassination through widespread media publicity couched in pain and concern for upholding ethics and values". Taking the powerful GSM operators head on for what he termed as holding of spectrum free of cost, Tata said, "Recent policy (allocation of licences in 2008) broke the powerful cartel which has been holding back competition and delaying the implementation of policies." He said the changing policy from auction to revenue sharing for telecom operators during the BJP regime could have cost a loss of about Rs 50,000 crore to the exchequer if calculated on the basis as done in the recent CAG report that said the 2G spectrum allocation scam cost Rs 1.76 lakh crore. 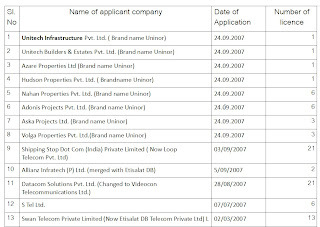 Detailing the developments in the telcom sector during the NDA government led by Atal Behari Vajpayee that he had asked the then prime minister for an "open and transparent" process.Alleging that Chandrasekhar had been actively liaisioning with the government in the telecom arena at the behest of powerful GSM operators, Tata said certain politically connected operators had wilfully subverted policies under various telecom ministers which has subsequently been regularised to their advantages. "The same operators continued to subvert policy, have even paid fees for spectrum, even before the announcement of a policy, and have de facto ownership in several new telecom enterprises. Chandrasekhar had accused Tatas of adopting double standards and had said in an open letter to Tata that by virtue of dual technology, according to the CAG, TTSL has caused a loss to the exchequer to the tune of about Rs 19,074.80 crore. On the issue of "out of turn" allotment to TTSL (as claimed by Chandrasekhar), Tata said "You have chosen to misrepresent the facts as they suit you to justify the claims you have made." Tata, who at present is abroad, said in an open letter to Chandrasekhar, "The company (TTSL) has strictly followed the applicable policy and has been severely disadvantaged..."
TTSL is yet to get spectrum in the key Delhi circle and also in 39 other districts. The 2G scam ostensibly revolved around Raja's alleged misdeeds and some parts of the CAG report were quoted as having indicted the minister, Tata said, adding "much has been made about the hypothetical loss to the exchequer in the grant of new licences and the grant of spectrum on the basis of 3G auction price. He asked Chandrasekhar why he chose not to mention about the excess spectrum held by powerful GSM operators and that too free of cost. "You have also not noticed that the CAG has not ascribed value to 48 new GSM licencees issued to incumbents between 2004-08 and 65 MHz of additional spectrum alloted to them during this period even though the CAG was supposed to cover the period from 2003," he said. He claimed that Tatas have not "wavered in upholding our values and ethical standards" despite the erosion in the ethical fabric in the country and despite the efforts of others to draw the group into controversy and endeavour to besmirch its records. "When the present sensational smokescreen dies down, as it will, and the true facts emerge, it will be for the people of India to determine who are the culprits that enjoy political patronage and protection and who actually subvert policy and who have dual standards. "I can hold my head high and say that neither the Tata Group or I have at any time been involved in any of these misdeeds," Tata said. "Taking a cue from the Supreme Court’s (SC) observations that the CBI should widen its probe in multi-crore 2G spectrum allocation scam, the government today formed a one-member committee of a retired SC judge to examine the procedures adopted by the department of telecommunications (DoT) in allocating spectrum and issuing licenses during 2001-2009. It is to be noted that the period also includes the one (2001-2004) when the BJP-led National Democratic Alliance government was in power. The move assumes importance because former telecom minister A Raja has been maintaining that he was following the policy of his predecessors. “The government has decided to set up a one-member committee comprising retired judge of SC, Shivaraj V Patil to examine appropriateness of procedures by DoT in the issuances of licences and allocation of spectrum during the period 2001-2009,” telecom minister Kapil Sibal told reporters. The minister said the inquiry by the committee is likely to be completed in four weeks......."
The Public Accounts Committee (PAC) of Parliament has invited suggestions on the 2G Spectrum scam. The Lok Sabha Secretariat has issued a notification inviting individuals and organisations to submit memoranda conveying their views on the spectrum allocation to the PAC. The move has been attributed to the the “nationwide interest” generated by the issue. Headed by senior BJP leader Murli Manohar Joshi, the PAC is looking into the CAG report on the issue while Joshi’s own party is pressing for a Joint Parliamentary Committee probe into spectrum allocation. പി.എ.സി, സി.എ.ജി യുടെ റിപ്പോർട്ടിൽ പറഞ്ഞിരികുന്നതിനപ്പുറം ഒന്നും അന്വേഷിക്കാൻ അധികാരമില്ലാ, അതു കൊണ്ടാണു ജെ.പി.സി വേണമെന്നു ആവശ്യപ്പെടുന്നതെന്നാണു പ്രതിപക്ഷവും ബി.ജെ.പിയും പരഞ്ഞുകൊണ്ടിരുന്നത്. ഇന്നത്തെ പത്രവാർത്ത പ്രതിപക്ഷത്തിന്റെ അവകാശം തെറ്റാണെന്നു തെളിയിക്കുന്നു. New Delhi: Fourteen months after the CBI first registered a case, former telecom minister A Raja, the central figure in the 2G license scam, has been questioned. CBI has grilled Raja for close to 18 hours on Friday and Saturday, confronting him with evidence that shows that his family members are associated with companies which benefited from the spectrum licenses. Raja's brother A Kelaiperumal, his wife Parmeshwari, C A Ganpathy Subramanyam and business associate Sadiq Batcha have all been raided by CBI. Sources say CBI suspects that the bribe money from the spectrum scam was invested in the front companies owned by Raja and his associates. In answer to the questions by media, Raja said, "Nothing can be shared with you since the investigation is pending, can't share anything." So, will Raja's kith and kin now face the heat? Raja's wife Parmeshwari is a director in Equss Estate – the company whose turnover went up from Rs 1 lakh to Rs 700 crore within a year. Parmeshwari's address as per the Equus balance sheet is 2A, Moti Lal Nehru Marg, New Delhi, which is Raja's official residence. The questions which crop up are - is Equus acting as a front for Raja? Was the bribe money responsible for the dramatic turn around in Equus Estate's fortunes? CBI has recovered incriminating evidence from its earlier searches and before the Supreme Court deadline of February 10, it has to complete the investigation in the 2G scam. It remains to be seen if CBI will question Raja's relatives next tto unearth the whole truth? Yes, because even a JPC is not going to prove anything beyond certain limit, as it had happened in the case of four previous JPCs. The demand of Opposition parties for JPC is politically motivated as the Opposition smells a comeback on this plank, the same way they exploited the Bofors scandal. Ultimately what happened in the Bofors case is known to everyone. Neither a JPC nor the concerted efforts by all those who opposed the Bofors and retained power from the Congress couldn't do anything when they were in power. Finally, when the Congress came back to power, even Ottovio Quotterochi was released and the case is now almost forgotten. Even this 2G case is also blown out of proportion firstly by the CAG which used the presumptive methods to assess the loss as 57,000 crores on the minimum and 1.76 lakhs crores the maximum. As such, how the opposition parties took the maximum 1.76 crores as the net loss to the exchequer and unleashed an all-out propaganda against Dr. Manmohan Singh about whom everyone is unanimous in their views that he wouldn't have benefited anything out of it. Then, the target of attack of mainline opposition is Sonia Gandhi and Rahul Gandhi. Even through the internet malicious propaganda is going on that the money is taken away to Italy and the mother and son duo should be shunted back to Italy. These are uncalled for allegations and everyone knows who are behind it. Secondly, a ruling party/combine can accept or deny any demand from the opposition. They are not bound to obey anything and everything the opposition parties demand. Even during the time of the NDA and other opposition party rules, they have not submitted to any amount of pressure from the then opposition party. As such, the adamancy of the opposition this time is motivated and they sense some sort of victory through foul means. The government on its part has taken all necessary steps to find the truth behind the 2G spectrum case. The Supreme Court of India is monitoring the case now. In fact, the SC intervened on a petition by Janata Party one man party President Subrahmaniam Swamy and the Court is very much after the case. The CBI is vigorously pursuing the case. Of course, the CBI has to act on its specific parameters and when the government found that the allegation is serious, it gave free hand to every investigation agency to go all out to find the truth. The culprit is belonging to an ally of the UPA the DMK. Even the appointment of A. Raja as the Telecom minister was initially not agreed to by Dr. Manmohan Singh. But, in coalition politics, there always remains certain compulsions and ultimately Dr Manmohan Singh had to yield under pressure and thus A Raja became the Telecom minister. Now, that when the inevitable has already happened, and all the speculations that were formed against his initial appointment in Telecom ministry proved genuine, Raja was immediately sacked and he is being interrogated to come out with the truth. Therefore, JPC can hardly do anything. Nor even when Dr. Manmohan Singh appears before the JPC, he has hardly anything to spell out before them, as he has already spoke enough on the subject. Of course, no Prime Minister in India, under a coalition form of government can do justice to his duty/responsibility and even the NDA's AB Vajpayee too faltered in many areas, particularly when the worst riots that independent India faced in Gujarat in 2002. If they stood on ground to justify such cruelties, the 2G spectrum is only financial irregularities that is doing the round based on mere speculation, the truth of which can be easily found by other criminal-legal mechanism already in existence in India. PAC or JPC: their propriety. Congress has for no reason avoided to set up JPC to enquire about G2 Spectrum scam. It is also true that Congress wants to hide many important factors which might be disclosed before the JPC. Congress wants to convince people that the function of both the committees is one and the same. Had it been so then why such different committees would have been provided under the Constitution of India. . The Congress wants to hide from the general public the different roles of both the committees. PAC is Public Accounts Commits which functions like a superpower audit authority on the public exchequer. It is the power of the Lok Sabha to pass budget and Finance Bill and there fore it has every jurisdiction to keep eye on income and expenditure made by its bureaucrat authorities. Auditor and Comptroller General of India keeps eye over such income and expenditure and the PAC reviews with all pros and cons. No parliamentarian or minister spends any rupee of his own accord but it is all done through the office they hold. Therefore the PAC has no jurisdiction to call any representative of the public unless and until he has drawing and disbursing authority. Obviously the Prime Minister has also no drawing and disbursing authority and hence it would be futile exercise if he is called by PAC. It is also to be noted that the Prime Minister is not a member of Lok Sabha but of Rajya Sabha. The Chairman of the RS has no control over PAC as it is part and parcel of Lok Sabha. As against this the Joint Parliamentary Committee consists of members of both the Houses and the committee has every right to summon anyone before it to enquire about the subject before it. The committee has every right to compel the attendance of witnesses to depose before it. JPC can summon Radia, Tata, Prabhu Chawla, Barkha Dutt or Veer Sanghvi, Ambani brothers etc. If the Prime Minister has no hesitation to appear and depose before the PAC why he should hesitate to appear before the JPC? Why JPC is not being formed to enquire about G2 Spectrum scam? Why it is only Congress which is avoiding to state openly about its opposition to form JPC? Why Congress blames opposition parties for halting proceedings in parliament? There is some very serious matter which may come out of the JPC and hence all such exercise is being made and this reveals that the Congress has no real intention to rein in the corrupt persons. Subramanian Swami has alleged that a large portion of the corrupt money received from G2 Spectrum scam was given to Sonia, sisters of Sonia and her son Rahul Gandhi. May be right or wrong but the facts should come before the public. If PM wants to prove to be like Caeser’s wife (beyond suspicion) and Sonia too then come forward and face JPC. People will remember them as good and honest persons otherwise they both will be remembered for G2 Spectrum Scam as Rajiv Gandhi is always remembered for Bofors scam. It should further be remembered that falseness lasts an hour and truth lasts till the end of time. Anyone who lives will know trying times. Hope good sense will prevail on the concerned persons. The Opposition parties are hell bent on their demand for constitution of a Joint Parliamentary Committee to probe the Spectrum scam. The Comptroller & Auditor General whose report showed a loss of Rs 1.76 lakh crore in 2G spectrum allocation has caused a heavy storm in our parliament. Though the Public Accounts Committee headed by senior BJP leader is looking into the scam, yet the party (BJP) and some Leftist members are not satisfied with the same and want constitution of a Joint Parliamentary Committee to probe the mistakes committed in the spectrum allocation. The government will have to bear revenue loss of Rs 57,666 crores. The JPC findings should also come out with ways to prevent recurrence of such blunders. Then only the constitution of JPC is fruitful because let the wise JPC members frame rules so that no mistakes ever occur in government dealings. The Parliament has become like a jokers house. A mistake was committed in allotment of spectrum to business houses. Some parameters were not followed and the CAG found that `had the tender system been followed in allotment of 2G spectrum, the Govt would have earned a lot of money. Spectrum/ or mobile is a free gift from our maker Almighty God. To sustain our life/democratic way of living, any mistake which has been committed should be buried. Man or a minister is bound to commit mistakes. To err is human but to forgive divine. Remember God has created man incomplete. We are still being ruled by Satan the devil. We including the Opposition have to realize how we have to prove our ways and not follow the ways of Satan the devil which are against humanity. There is so much for the Opposition to do for us. Even if suppose the guilty of the spectrum allotment are out, what will happen? At the most you will like to punish them. I feel that our life has become a negative way of life. I remember when I was returning by the Khushinagar Express from Mumbai to Bhopal. I had taken e-ticket but failed to carry identity card in original. Even though I had the photo copies of not one proof but three still the special checking man did not spare me. Despite of my pleadings that I was not a cheat to the Rlys, he threatened me to get down at Kalyan. I had no choice but to pay him (the whole fare plus penalty as framed by the Rlys.) What a dilemma of sorts and an unfortunate life we are living. We don’t have trust among ourselves; those in authority/power like the TTEs are even worse for gullible passengers! Jesus truly said `When the son of man returneth to earth, shall he find faith on earth? Similarly, the Opposition has no faith in the ruling party members. They think all are cheats! How much is the JPC probe going to reveal and will it change the lifestyle of the House nobody knows. It is better the parliemant disbands some of these extra committees otherwise the Opposition will be after the ruling party to put to use these provisiosn. Communications minister Kapil Sibal today said the recent report of the Comptroller & Auditor General (CAG) was “erroneous”, and the government had not made any losses on awarding new licences and allocating 2G spectrum in 2008 as projected in the report. Sibal also said CAG did not understand technical issues and that had been the key to its miscalculations. In a damning report in November last year, CAG had said the government had incurred a notional loss of over Rs 1,70,000 crore by issuing new licences and spectrum in 2008, as it did not follow the procedure for offering spectrum at prices fixed in 2001. 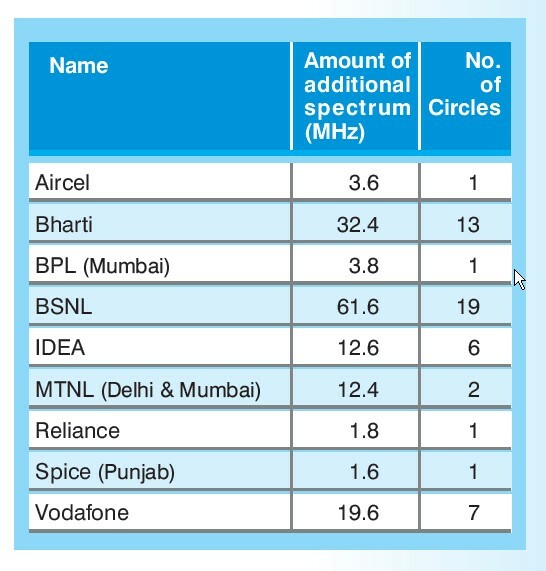 It had calculated the notional loss based on the price which companies paid during the auctioning of 3G spectrum during May-June 2010, saying the two should be equated. The controversial report was one reason behind the resignation of former communications minister A Raja, amid allegations that he was involved in a huge scam which led to losses to the exchequer. Sibal’s indirect defence of Raja comes at a time when the Central Bureau of Investigation was investigating links between the former minister and the various telecom companies he allegedly favoured in awarding licences and airwaves. 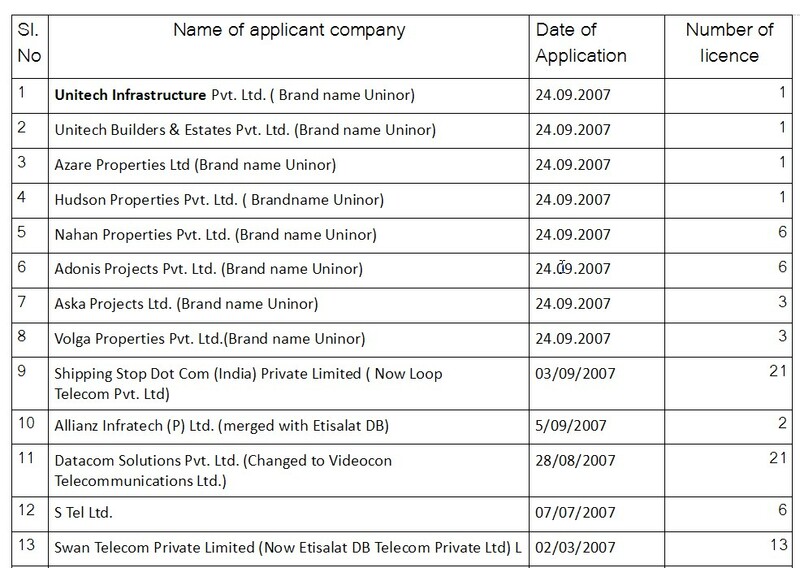 Sibal admitted “procedural lapses” in implementing the licencing policy and that he would take action if evidence was found. CAG declined to respond to Sibal’s criticism, saying a decision on the report was a matter for Parliament to decide. “Once submitted to Parliament, CAG reports are the property of the Public Accounts Committee. No one in CAG can comment on any observations made on the report,” a CAG official said. CAG, however, valued the price of the entire spectrum, including 4.4 MHz which comes as start-up bundled with the licence. 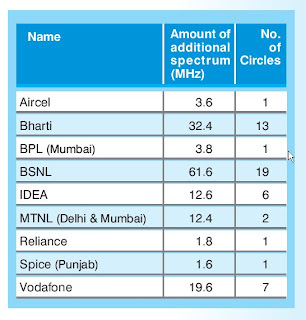 Any additional spectrum currently is given based on subscriber numbers. Sibal also said as e 3G spectrum was three to four times more efficient than 2G, the prices could not be equated as CAG has undertaken to do. Also, the value of spectrum in 2008 could not be equated with a price of an auction held two years later in 2010, he maintained. The minister attacked the NDA government again, saying its policies, including a shift from fixed licence to revenue share, had led to a notional net revenue loss of over 1,50,000 crore.